ProForm SMART Strider 895 Review by Industry Experts! The ProForm SMART Strider 895 Elliptical Trainer is ON SALE! Award Winning – Ergonomically Designed and Loaded with Features! Price Alert: This is $100 OFF the Regular Price! The ProForm SMART Strider 895 elliptical trainer is very similar to the ProForm Smart Strider 695, both offering the snap assembly. The major difference is the SMART Strider 895 comes with an Android browser for the console display. Both machines come from parent company ICON fitness, which also makes all NordicTrack machines. As a result of ICON’s shear size of production, NordicTrack and ProForm are often able to provide higher spec machines at a lower price than some of the competition. The ProForm SMART Strider 895 is the newest version of the older Smart Strider 935. MID-WEEK SALE ENDS THURSDAY: The ProForm SMART Strider 895 is reduced to $999 with FREE shipping and a 30-day money back guarantee. Financing is Available.This is $100 OFF the Regular Price! The rear drive design on the ProForm SMART Strider 895 elliptical trainer is based on the patented design of Precor ellipticals. Precor builds some of the best ellipticals in the world, and in fact they were the originators of the cross-training machine. The rear drive design is favored by many elliptical users. The elliptical motion on rear drive machines tend to be more ergonomic, and have a more natural feel. In addition, as you raise the incline the motion maintains a truer elliptical path. With front drive machines when you incline the motion you warp the elliptical path. 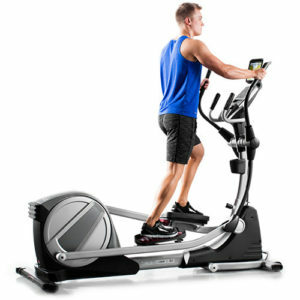 The ProForm SMART Strider 895 elliptical is equipped with an full color touch screen display. This SMART series console comes with an improved HD touchscreen with a faster and more responsive touchscreen. Plus, this machine is newly optimized for iFit Live workouts. There are quick select incline and resistance buttons framing the touchscreen. 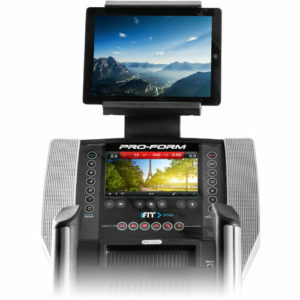 iFit Live is the signature feature found on all ProForm and NordicTrack elliptical trainers. iFit Live allows your elliptical machine to communicate with the Internet. Through you iFit.com account you can create customized workouts and focus on particular fitness goals like losing weight and fitness training. These programs cover several weeks and are progressive. They include audio coaching from Jillian Michaels. After each workout, your stats are downloaded to your iFit.com account so you can monitor your progress. You are also able to trace routes on Google Maps and the ProForm SMART Strider 895 will simulate the terrain with the incline feature. With your Android browser you can visually watch your progress. Once again, your stats are downloaded onto your iFit.com account. While all three Smart Strider models have iFit Live, this is the only version that allows you to view your iFit workouts directly on the elliptical console. For comparison, the Smart Strider 695 and Smart Strider 495 both have a Round Watts LED display with no touchscreen. NOTE: At the time of this writing, this machine comes with FREE 1-year iFit Membership. The Smart Strider 895 is a power adjustable incline machine that lets you adjust the incline from 0 to 10 degrees. This feature lets you target muscles in your thighs, hamstrings, and calves for a more effective workout. This is an excellent feature to have because it allows you to get a more effective workout. Be aware that the Smart Strider 495 model does not have an incline feature. Typically, assembling an elliptical trainer is anything but a snap. They designed the ProForm Smart Strider 895 so you can easily assemble it right out of the box. It takes only 4 steps. That is in comparison to taking several hours and often two people. You don’t have to break your stride when you want to adjust the resistance or incline. The controls are conveniently located on the moving handles. You can fold the Smart Strider 895 into an upright position thus freeing up space when not in use. You have a variety of challenging workouts that focus on different fitness goals. These programs control the resistance and incline of the machine. All standard items on most elliptical trainers, however, the speaker systems used by ProForm tends to be above average. Being over-sized, you can better position your foot to your comfort zone. Being cushioned, the pedal better absorbs impact. Being adjustable, you can angle the pedal to reduce foot lift. This handy feature lets you mount your smart tablet on the top of the treadmill for added entertainment options. You get lifetime frame, like anything is going to happen to the frame. You also get 3 year parts and 1 year labor coverage, which is standard at this price range. ProForm Smart Strider 695 – Read our full review here. With all the included features, the ProForm SMART Strider 895 is worth considering, particularly when you factor all the features that are included and the ergonomic rear drive design. However, there is another consideration. Last we looked, they discounted the ProForm Smart Strider 695 elliptical trainer to $799, which is basically the same machine without an Android browser. So for $200 less you can buy the Smart Strider 695, and spent part of the left over $200 on a Kindle Fire. The Smart Strider 695 is also a better option if you already own a smart tablet! can you tell me what the ceiling height requirement would be for your elliptical machines. I am looking to put one in my basement and there is a ceiling height of 7 foot. I am 5’11. Hi Patrick, you need to add 18 inches to your overall height to determine minimum ceiling height.